While much of the US news media have endured shrinking audiences in recent years, segments of the ethnic media have seen significant growth. One industry group has found that the number of Hispanic daily newspapers alone has grown from about 14 in 1990 to more than 40 in 2004. Capitalizing on the expanding Latino market, US English-language companies have been buying up or starting their own ethnic outlets as well – consider NBC’s purchase of Spanish-language broadcaster Telemundo or the Tribune Company’s Hoy! newspapers. One thing all media organizations have certainly noticed is that the US immigrant population – peopleborn in other countries — has jumped from 19.8 million in 1990 to nearly 36 million in 2005. There are still challenges ahead for the ethnic media, however. A 2003 Pew Hispanic Center surveyshowed that second- and third-generation immigrants move away from their native language and toward English as their primary language. And the recent $12.3 billion sale of Hispanic broadcasting giant Univision to a group of private investors raised questions about whether former owner A. Jerrold Perenchio was motivated by concern that ethnic media growth might be peaking. In this, our seventh in PEJ’s series of nine roundtables with industry experts on the future of the news media, ethnic media professionals believe several crucial factors are working in their favor. .All seem to agree that while conglomeration is the standard in the mainstream media, the niche audiences that ethnic media reach have a real value in an age of cultural segmentation. At the same time, they argue the ethnic media are not pushing their users into a different, non-English-speaking America – rather they are building a bridge for new Americans who are often undeserved by the mainstream media. 1. What kind of role has the ethnic media played in this year’s immigration debate and if it has, does that role signal a larger change for the ethnic media in the years to come? Edward Schumacher: The Hispanic media has been a leader in the movement and debate. Radio, led by on-air personalities, particularly for morning drive time shows, played an unusual activist role in urging listeners to march or boycott. Many radio stations acted more like stations in Latin American than here. TV backed off to play it neutral, but the extensive coverage by itself spread the word. Newspapers editorialized heavily in favor of immigration reform and presented the news in a light sympathetic to illegal immigrants. That said, most of the Hispanic media seemed to recognize the need for improved, or at least more rational immigration controls. The ethnic media gets ever more attention from mainstream political leaders. 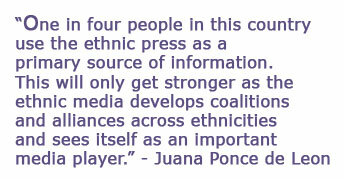 Juana Ponce de Leon: Without question, the ethnic media has been a driving force in the immigration debate. If we are to judge by the massive demonstrations of immigrants across the country calling for a comprehensive and just immigration reform, you can count on the fact that they were kept informed on the nuances of the immigration reform debate, as well as the preparations for the protests. Ethnic media is the only print media sector that is growing in the United States. According to a poll conducted by Sergio Bendixen for New California Media in June of 2005, one in four people in this country use the ethnic press as a primary source of information. This will only get stronger as the ethnic media develops coalitions and alliances across ethnicities and sees itself as an important media player. Ahn Do: Immigration is a topic constantly covered in ethnic media, particularly in newer immigrant communities such as Southeast Asians. So we’re going to monitor the changing developments on this beat, and we’re going to speak up, speak out, or speak in favor of whatever happens affecting borders, citizenship, identity and race. 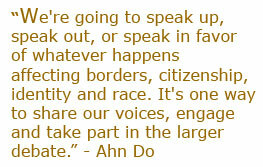 It’s one way to share our voices, engage and take part in the larger debate. Ethnic coverage has enlightened readers and helped them to grasp that this is not just a Latino-only issue in that it affects huge segments of the population, including those who are dependent on current U.S. citizens and waiting for visas to resettle here. Sandy Close: The massive immigrant rights demonstrations brought attention to the role of ethnic media – not just deejays but an entire eco-system of media vehicles serving ethnic audiences, from street DVDs to Univision, from Spanish-language to hip-hop to Vietnamese. The role ethnic media played in informing and engaging and mobilizing audiences was not new. 2. A lot has been made of the growth in the ethnic media, but the numbers last year indicated a drop in circulation at some Hispanic newspapers and now Univision is possibly looking for a buyer. Are the ethnic media in for a slowdown? Have they peaked? Edward Schumacher: I see no generalized drop in circulation in Hispanic papers and in fact see the reverse: continued growth. I do so see a move to free papers, but that reflects a general trend in the mainstream industry. In many ways, Hispanic papers are on the cutting edge and cutting to the chase: mainstream metro papers, outside the national papers such as NYT and WSJ, are being whittled by inflation down towards free or irrelevant costs, and may never have the pricing power to raise newsstand rates. The sale of Univision has nothing to do with the future of the industry. Its purchase by its current owners was a financial play, not a strategic one, and the sale now is nothing more than an orthodox financial flip. Not selling would raise more questions, at least in the finance world. Juana Ponce de Leon: While the corporate Hispanic media may be experiencing the same print distribution woes as the Anglo publications, there is a robust growth in local/community Hispanic papers. The local papers do what the corporate papers can’t: they inform the community of their own issues and local happenings and help organize the community by pointing its readers to service sources and connecting them to the larger society. As long as there is an immigrant inflow to the US, there will a need for these newspapers. They meet that demand. Ahn Do: Ethnic media, like in other industries, compete within its own ethnic group and the mainstream for dollars and market penetration, and there will be failures, wild successes and consolidation. The organization that thrives is the one that’s able to blend different worlds, move between worlds, maintaining its own editorial and community-outreach balance in its own world. Sandy Close: The remarkable growth of ethnic media over the last two decades has occurred with very little investment from those entities that have long sustained mainstream media: big business, government, academia and philanthropy. It hasn’t even begun to feel the impact of investment from these “Big Four” investors, and when it does, it will grow even more robust. The Hispanic media experiencing decline in circulation may be those without strong roots in local communities – or those that have found ad revenues drained by competing Hispanic TV and radio outlets. Overall, the Pew Hispanic Center polling found that audience for Hispanic print is rising as the number of media outlets expands. When Viet Mercury was closed down by Knight Ridder in San Jose, virtually all but one of the independent Vietnamese language media outlets that predated Viet Merc were still operating. That suggested to me the enduring power of ethnic media when they are embedded in the communities they serve. 3. What are the growth strategies for ethnic media that serve smaller populations? The Hispanic media have been able to nationalize somewhat. Is that possible for smaller ethnic groups? Is it important in today’s economic environment? Ahn Do: Growth strategies for ethnic media serving smaller populations? I’d say targeting second-generation readers, boosting online resources, boosting partnerships between ethnic and mainstream outlets and who knows, having an IPO. Sandy Close: Ethnic media play a critical role in the economic vitality of their communities. Without ethnic media, small businesses would find it almost impossible, for example, to grow their customer base. And without small business advertising, ethnic media could not sustain themselves, however committed to serving their communities they are. 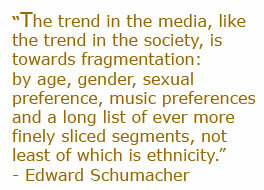 Edward Schumacher: The trend in the media, like the trend in the society, is towards fragmentation: by age, gender, sexual preference, music preferences and a long list of ever more finely sliced segments, not least of which is ethnicity. Advertisers, too, are looking for targeted niche products. Juana Ponce de Leon: I believe that local papers sprout up where there is a need. I don’t think that there is an organized strategy for growth, however, if you ask to a Pakistani editor in New York about his/her community beyond New York, they will be able to tell you where they are concentrated and which publications serve them. Some ethnic newspapers are actually national, including World Journal, India Express, India Abroad, Urdu Times, Epoch Times, The Forward, Korea Times and Yedioth Ahronoth and quite a few ethnic papers cover national stories and their communities in other parts of the States. Many of the ethnic newspapers are mission driven, they serve as advocates for their community so they identify locally. Perhaps the changing demographics of the United States will dictate the need for communities to consolidate efforts and push for a national presence, in the manner that has happened with Hispanics papers. 4. When the newspaper business was stronger, larger mainstream companies bought up smaller ethnic newspapers. Now that the newspaper industry is struggling, some of those papers have lost funding. Were these alliances and the resources they supplied ultimately good or bad for the ethnic media? Will such alliances be embraced or avoided in the future? Sandy Close: I believe we’re going to see many new initiatives by mainstream media to collaborate editorially with ethnic media or develop specialized niche editorial initiatives (the SF Chronicle’s Pinoy I-pod is one example). Media experiments like the Viet Merc and Nuevo Mundo, launched by Knight Ridder, ultimately helped raise the editorial standard in their respective ethnic media spheres. And their editorial leaders were committed to the principle of serving their communities as sources of news, information and entertainment. But a key role of ethnic media has always been that of “advocate” and public spokesperson. The independent ethnic media that survive despite low ROIs [returns on investment] are those committed to that leadership role that goes above and beyond gathering and transmitting news and information. The banner headline of La Opinion on March 25 was “A Las Calles!” The Lozanos [who own La Opinion] are developing an important model for combining ethnic media embedded in communities and committed to advocacy roles with a growth strategy of building a chain. It’s one of the most exciting experiments out there. Juana Ponce de Leon: I think we are still analyzing the fall out from the Knight Ridder divestiture of its Vietnamese papers. I also know of specific attempted buyouts that did not take place because the ethnic publishers did not wish to be bought out. Ahn Do: Alliances between mainstream companies and ethnic newspapers will continue to happen because of the need to share reporting resources, cultural knowledge and marketing know-how. A mainstream company might have an established brand-name, boosting the credibility of the smaller, ethnic publication, but needing to work with the latter to better understand and connect with the assimilating immigrant reader. Edward Schumacher: I believe only Knight Ridder’s San Jose Mercury has pulled funding (of Spanish-language papers), and even then it bought a syndicated replacement. It is way too soon to see the making of a trend there, as by most accounts the Hispanic papers of mainstream companies are profitable and growing. The entrance of the mainstream papers into the market, meanwhile, has been good, in that it has raised the quality bar. On the slip side, many of the mainstream papers are less dedicated to real journalism that reflects the interest of the ethnic communities. They prefer instead to produce light, entertainment-oriented, low-cost weeklies designed as defensive measures to hold on to the virtual print advertising ad monopolies they have in their metro markets. KR’s El Nuevo Herald and La Estrella, Tribune’s three Hoy papers and Belo’s Al Dia are exceptions, in terms of investment and reporting. 5. Some argue that the ethnic media, particularly the more developed Spanish-language media, in some ways actually hold down immigrant populations by allowing them to live in a separate Spanish-language world in the United States. What do you think of this argument? Edward Schumacher: Bull—-. The Hispanic media serves as a bridge to the mainstream, and actively – very actively – works to do so in its content. Hispanic readers are hungry for just such content, and the Hispanic media, far more than the mainstream media, fulfills that hunger. While there may be exceptions I don’t know, the Hispanic media does not push for an officially bilingual country or the retaking of the Southwest by Mexico. The Hispanic media responds to a natural anthropological phenomenon around the world: people prefer to consume media in their mother tongue. This includes music, TV, movies, magazines and newspapers. Americans living in Europe do the same, reading the IHT or WSJE, for example. If the Hispanic media didn’t exist, the English-language media would not capture the bulk of that audience. It simply wouldn’t read or watch much TV. Later generation Hispanics, educated in English, prefer English-language media, as they naturally should. Some may tune into specific television or radio shows in Spanish, or occasionally read a Spanish publication, all for its cultural content, but that is enriching and differs no more than from time-to-time tuning into a blues or pop radio station or reading a surfer magazine, all part of the amazing variety in the US media smorgasbord. We forget that in different times in our past there have been powerful and large newspapers in languages such as German, Italian and Polish. Sandy Close: What paralyzes people is isolation – not just geographic but cultural; a sense of being excluded, ignored, invisible. “Today we March, Tomorrow we Vote!” was a key slogan in the demonstrations, whether in English or Spanish or Tagalog. The message was clear: we’re becoming public people; we’re announcing ourselves as participants in the larger public realm. Nothing could be more American than that, as Richard Rodriguez wrote in “Hunger of Memory”. To become American is to adopt a public persona. Absent a voice and visibility in the media culture of America, you don’t belong. Ahn Do: People tout this argument because they want to live in an English-only world. But the reality is that we’re all working and learning and growing today in an environment that values diversity. The diversity of languages goes hand in hand with that. Juana Ponce de Leon: Immigrant communities need to understand where they are and how it works. Without their local newspapers in their language, this organizing task would be messy and unwieldy at best. Foreign-language ethnic papers serve a vital role for their community. The assimilation usually takes place organically as the children of immigrants get schooled in English and they assimilate, often serving as a bridge between their parents and the social system. 6. One broad trend we sense in the media culture is the paradox of more outlets covering fewer stories. As the audiences for particular news outlets shrink, newsroom resources are then reduced, but these outlets still feel compelled to cover the big events of the day. The result is more outlets covering those same “big” events and fewer are covering much beyond that as much as they once did. How do you view this trend? Edward Schumacher: It isn’t sustainable. Newspaper chains will move someday to the network TV model, sharing the same national and international stories and possibly whole sections and inserts much more so than today, and there may even be sharing among chains. Meanwhile, the smarter ones will use their freed resources to zig while everyone else is zagging, in addition to improving local coverage. Juana Ponce de Leon: It is unfortunate because it means that there are fewer people and little diversity in the framing of the issues. With the explosion of bloggers and online news venues, if you are English-speaking, you have access to more points of view. Ahn Do: Ultimately, I think the trend here shows a greater need for ethnic media because should those day-to-day stories include issues vital to immigrant lives – but then are missed – we have the newspapers, TV and radio stations in those individual communities on hand to provide news. And the more in-depth, the better. Sandy Close: What is striking to me, as a journalist who started reporting in the Far East during the Vietnam War, is that for all the talk about media consolidation and homogenization of news, it’s the mainstream media outlets today, not the “alternative” press, that are breaking the big stories – from Time Magazine which broke the Haditha massacre story to the WP that broke the story on renditions….By contrast, My Lai was broken by Dispatch News Service, an alternative service of freelance writers. Moreover, the real impediment for journalists is the sheer danger to life and limb of reporting on the ground in places like Iraq, Afghanistan, Sudan. Were I to practice the kind of journalism I/we did in Vietnam in the 1960s in Iraq today, I’d probably wind up like Jill Carroll or Stephen Vincent, a hostage or dead. This underscores part of the great challenge in trying to sustain the “communal” or “social” role of news – connecting audiences to each other and, more importantly, show where and how they fit into the larger whole. Not just dangerous war zones, but global societies like California’s, with unprecedented diversity, pose the question: how do we reflect who we are becoming as a society, as world? I was at an SPJ-Media Alliance-sponsored meeting in San Francisco last night of journalists talking about the “threat” of media consolidation and everyone emphasized “local, local, local”. As if Afghanistan weren’t absolutely critical to “local” news ( Union City and Fremont represent centers of the Afghan diaspora). Local, in the words of Harlan Cleveland some years ago, is now “glocal” and global is now “glocal.” More than ownership issues, I worry about our capacity to communicate with each other across the unprecedented diversity of the global society in which we all now live.